As far as frost goes, things have gone pretty well in the garden this short growing season in Calgary. Getting through the summer months and into early fall before the mercury (or in my case alcohol) finally fell down below zero was welcome relief from some years when I have had to put up with some “late summer snow”. With this temperature plunge in the wee hours, so turned my attention to collecting the above ground produce which includes a few nice specimens of squash and zucchini. Emphasis though on “few”. A few words for the botanically inclined. 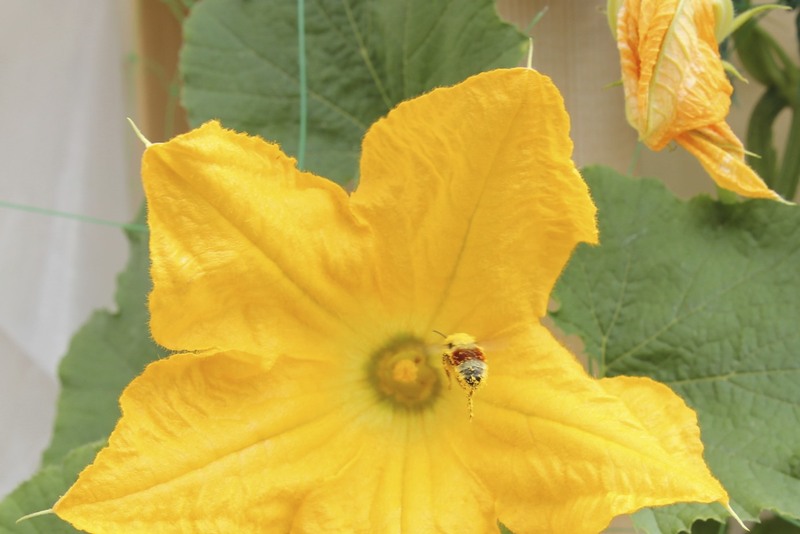 The cucurbits (that is, squash, zucchini and cucumbers) are monoecious, meaning that there are male and female reproductive parts on the same plant but in separate flowers. The normal thing is that more male flowers come out in the early season and the females come along later (you can tell the difference by the small swelling-the ovary, a little squash fruit, appearing at the end of the stem below the female flowers). Trouble was, my small population of plants was skewed towards the boys. And, although I had no need to brush around the flowers with Q Tips (the bees were around to help with pollination), the result was a small number of ripe fruits compared to plants and flowers. So I did a bit of digging for some explanation and that pointed at some possible causes of stress. True, we don’t see things warming up in YYC until May/June and we saw a lot of rainfall in spring/early summer. Not a lot I can do about that. Maybe I overwatered the plants in my eagerness to bring ’em along. Or I planted too many seeds, too close to one another. I can try and thin out the rows next year. Not all goes to seed with this floral story. A culinary idea I picked up from Hugo’s restaurant in Houston showed me how tasty these flowers can be. Good as the menu is (actually it’s terrific-you should go! ), the recipe came from owners/chefs Hugo and Ruben Ortega’s book, Street Food of Mexico. 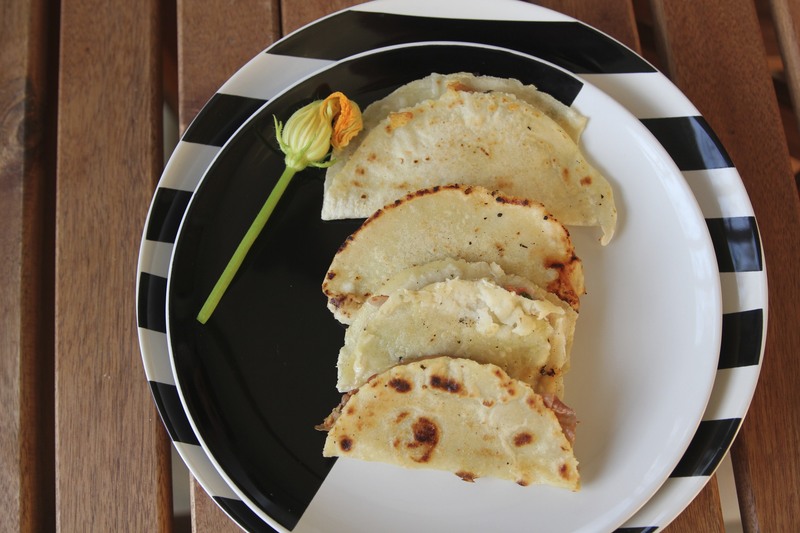 Called Quesadillas de Flor de Calabaza (Squash Blossom Quesadillas), this benefits from making your own tortillas from masa. Also, I made some modifications with the cheese and herbs, substituting mozzarella and garden fresh oregano for quesillo and epazote since these were closer to hand. So my poor flower ratio balanced out fine in the end. My family and I have enjoyed squash fruits and squash bread as well as a new variety of quesadilla.